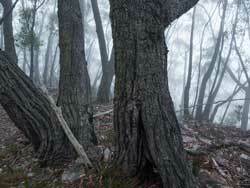 The dry sclerophyll forests of the Greater Blue Mountains are the most widespread of the ecosystems and contain much of its eucalypt diversity. These forests are the flammable matrix that carries fire across the landscape. 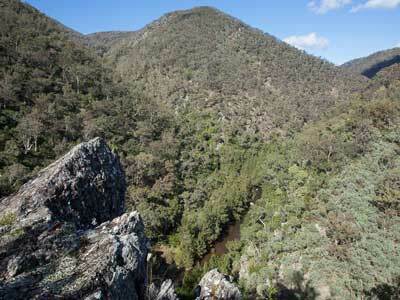 Dry sclerophyll forests occur across almost 85% of the Greater Blue Mountains. They dominate the exposed, low-nutrient soils of the vast sandstone plateaux and the valley slopes of the softer Permian geological deposits. 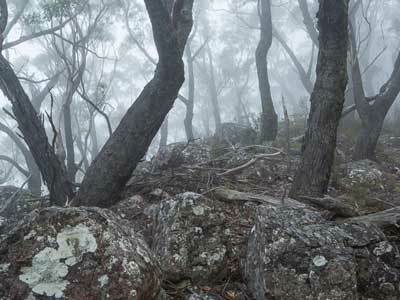 Nine classes of dry sclerophyll forest occur in the Greater Blue Mountains; they vary greatly in composition, including in their canopy eucalypts, reflecting differences in the topography, soil and climate in the areas in which they are found. The seven classes with predominantly shrubby understoreys are found on silica-rich sandstone-derived soils, while a further two classes with a conspicuous presence of grasses and herbs in the understorey, in addition to shrubs, are found on marginally better soils. 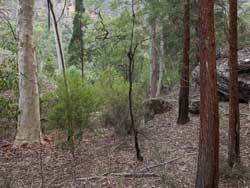 Of the classes with predominantly shrubby understoreys, by far the most widespread are the Sydney Hinterland Dry Sclerophyll Forests. 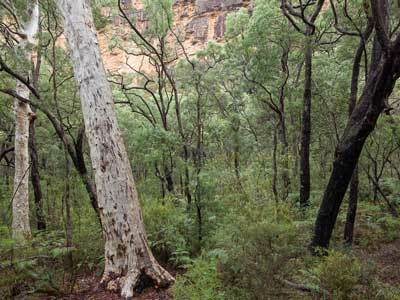 These forests dominate the sandstone slopes and ridges at low- to mid-elevations in the Greater Blue Mountains, in the coastal rainshadow (which generally receives less than 1000 mm per year) from northern Wollemi and Yengo through to Nattai National Park. 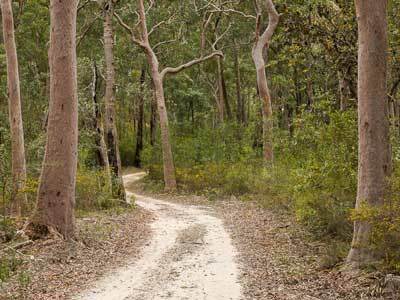 Tree species that are particularly distinctive in these forests are Yellow Bloodwood (Corymbia eximia), Scaly Bark (Eucalyptus squamosa) and Narrow-leaved Apple (Angophora bakeri), which occur alongside numerous other common sandstone eucalypts. Sydney Coastal Dry Sclerophyll Forests and Sydney Montane Dry Sclerophyll Forests also occur on the quartz-rich sandstone soils, replacing these hinterland forests in areas of higher rainfall (more than 1000 mm per year). 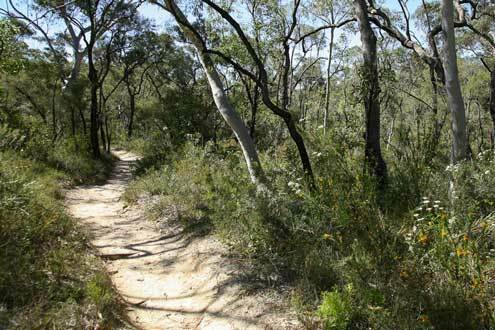 The coastal forests are uncommon in the Greater Blue Mountains, being found only on the eastern fringe of Yengo National Park: they are more extensive nearer the coast. They are characterised by Smooth-barked Apple (Angophora costata), Red Bloodwood (Corymbia gummifera) and Broad-leaved Scribbly Gum (Eucalyptus haemastoma), among other eucalypts, over a diverse understorey of sclerophyllous shrubs that are often taller and denser than in other dry sclerophyll forests in the region. The montane class is more extensive in the Greater Blue Mountains, occurring across large areas of the higher plateaux, generally between 750 and 1200 m above sea level, including around the towns of the upper Blue Mountains and on the Newnes Plateau. The striking forests dominated by Blue Mountains Ash (Eucalyptus oreades), which occur in sheltered locations and on the precipices of the escarpment, are included in this montane class. Other characteristic species in these forests are the peppermints (Eucalyptus piperita, E. dives and E. radiata), Silvertop Ash (Eucalyptus sieberi) and stringybarks (including Eucalyptus blaxlandii). Sydney Sand Flats Dry Sclerophyll Forests also occur on nutrient poor, sandy soils, but are highly restricted within the Greater Blue Mountains where they are found in only one location – the alluvial white sand deposits at Mellong in the upper reaches of the Macdonald River. 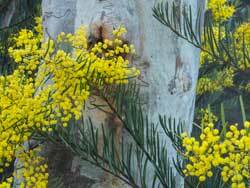 In the rainshadow of the Great Dividing Range, three more classes of shrubby dry sclerophyll forests are found, all of which have their main distributions well beyond the Greater Blue Mountains to the south, west, and north of the state. In the high-altitude, south-western parts of the World Heritage Area, the South East Dry Sclerophyll Forests and Southern Tableland Dry Sclerophyll Forests are the predominant vegetation classes. Silvertop Ash (Eucalyptus sieberi), Broad-leaved Peppermint (Eucalyptus dives) and Blaxland’s Stringybark (Eucalyptus blaxlandii) often dominate the former, while Red Stringybark (Eucalyptus macrorhyncha), Scribbly Gum (Eucalyptus rossii) and Mountain Gum (Eucalyptus dalrympleana subsp. dalrympleana) may dominate the latter. In the northern parts the Western Slopes Dry Sclerophyll Forests are restricted to small areas on the dry, lower slopes of the ranges in western Wollemi and Gardens of Stone national parks: they can be distinguished by the presence of ironbarks (Eucalyptus sideroxylon) and native pine (Callitris). Their main occurrence is further north-west. 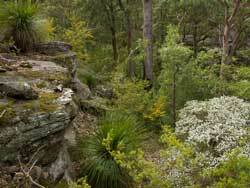 Of the classes of dry sclerophyll forest with a mixed shrub/grass understorey in the Greater Blue Mountains, the Central Gorge Dry Sclerophyll Forests are the most widespread, occurring extensively on the steep slopes of the Cox’s, Kowmung, and Wollondilly river valleys of the southern Blue Mountains, Kanangra and Nattai national parks. They are often characterised by Forest Red Gum (Eucalyptus tereticornis), Yellow Box (Eucalyptus melliodora) and Narrow-leaved Ironbark (Eucalyptus crebra). 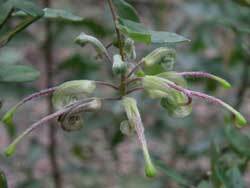 The Hunter-Macleay Dry Sclerophyll Forests are highly restricted, occurring in rain shadow areas on the footslopes of the ranges bordering the Hunter Valley in north-east Wollemi and Yengo. Typical trees are Spotted Gum (Corymbia maculata), Narrow-leaved Ironbark (Eucalyptus crebra) and Turpentine (Syncarpia glomulifera). Hunter Valley Footslopes Slaty Gum Woodland (vulnerable), a type of Western Slopes Dry Sclerophyll Forest, may occur on the northern fringes of Wollemi National Park. 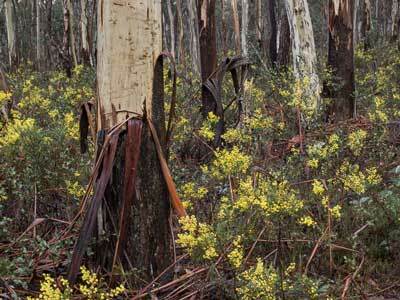 Various wattles are common understorey components of Dry Sclerophyll Forests. Two scribbly gum species are widespread in dry Blue Mountains forests: E. sclerophylla in the east and central, with E. rossii taking over in the west. Suspended on a stalk and looking much like a spider hanging by its silk thread, it is easy to see where this delightful wildflower gets its name. The flower is around 60mm across. 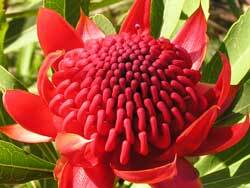 The floral emblem of New South Wales. The crimson flowers appear in spring and are 15cm in diameter. Truly magnificent. The dry, ‘bony’ ridges of the southern Blue Mountains' metasediments are prime habitat for South East Dry Sclerophyll Forest of Silvertop Ash. This complex bushland features Smooth-barked Apple (Angophora costata), Turpentine (Syncarpia glomulifera) and a stringybark (Eucalyptus sp. ), with Christmas Bush (Ceratopetalum gummiferum), grass-trees (Xanthorrhoea sp. ), flowering peas and tea trees (Leptospermum sp.). This vegetation class is characterised by Cypress Pine (Callitris sp. - foreground trunks and rear), and here includes Inland Scribbly Gum (Eucalyptus rossii - left) and Sydney Grey Gum (E. punctata - right background).